If you think you need some high-priced device to enjoy delicious cold brew coffee at home, you couldn’t be more wrong. The Takeya Patented Deluxe Cold Brew Iced Coffee Maker is an Amazon best-seller for good reason. 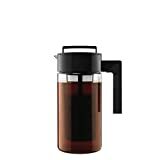 It features a great design with an air-tight seal and a comfortable silicone handle, and it makes four large cups of coffee per brew. It’s also completely dishwasher safe, so it’s not a hassle to clean like some rival products. At under $20 on Amazon with free Prime shipping, it’s the best purchase any cold brew lover can make.